Artists Helen Kruljac and Alisha O’Neill explore mixed media in their latest exhibition at Sourdough Kitchen in Seddon. Alisha O’Neill is an artist who approaches all creative projects with energy and enthusiasm. With her free flowing brush marks, strong sense of colour and bold use of form, Alisha’s paintings are exuberant and vibrant. Helen Kruljac is an artist of quiet intensity who follows rhythm of her own drum . 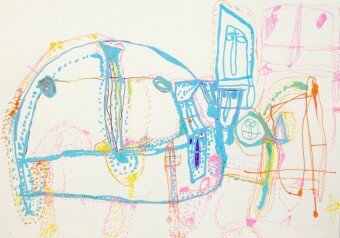 Her drawings use line and colour to express a world, sometimes crowded with noisy figures all vying for space, or the opposite, a poignant expression of the solitary. VENUE: Sourdough Kitchen, 172 Victoria Street, Seddon. Open 7am – 4pm daily. Image: Artwork by Helen Kruljac.